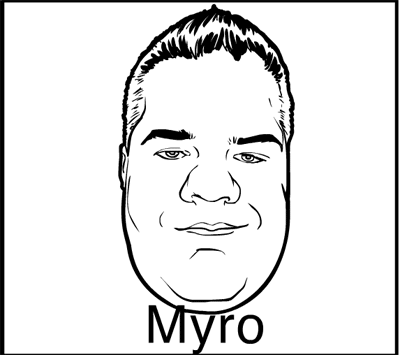 I've just added Myro's portrait to the Head-Winners set as his prize for winning Caption Contest 116. Now you can make your very own Super Myro! OMG, I’m so making you into a character, dude! I see crime boss over the shipping yards…. OMG, I’m so making you into a character, dude!I see crime boss over the shipping yards…. Haha nice! With the suit and fedora combo? You’ve gotta post it once it’s done. Dan: Haha nice! With the suit and fedora combo? You’ve gotta post it once it’s done. LMAO! Oh, I have to see this. Mostly because I’ve done this enough in real life. See how it works out. Omg! That looks just like myro. I should know cause he is my sweetie! Thanks Kim. Everyone say hi to my fiancee who probably won’t even come back because she thinks she isn’t geeky enough to hang with us. Thank you, Jeff. Myro has only good things to say about you and this site.